A common misunderstanding is that burial of the Prophet (Allah bless him and give him peace) in the room of Sayyidah Aishah (Allah be pleased with her) is from the special prophetic qualities (khasais al-nubuwwah) which do not apply to others. Scholars have argued that this in incorrect as Sayyiduna Abu Bakr al-Siddiq, Sayyiduna Umar (Allah be pleased with them) are also buried alongside the Prophet (Allah bless him and give him peace). 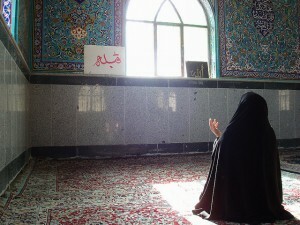 Likewise Sayyidah Aishah initially wished to also be buried in the room as did Imam Hasan (Peace be upon him). Sayyidah Aishah (Allah be pleased with her) would offer her prayers in the room containing the graves without any barrier between her and the noble graves, and on Fridays when space ran out in the masjid people would pray in the room containing the noble graves. After the passing away of the Prophet (Allah bless him and give him peace) the prominent companions (Allah be pleased with them) differed over where he should be buried. Some said he should be buried in the masjid itself by the pulpit (minbar) or in the prayer area. Some said he should be buried alongside the other companions in al-Baqi; this was detailed by Imam Malik in al-Muwatta (1/231) and Hafiz Ibn Abd al-Barr in al-Tamhid (24/394). The narration related to the where the Prophet (Allah bless him and give him peace) is currently buried is well known and does not require citing. What is important to note is that the initial difference regarding the specification of the burial location indicates that all of these locations were regarded as lawful places for burial, though agreement was finally reached on the current location. The Prophet (Allah bless him and give him peace) was buried in his room, after which his two companions were buried, after which Hasan was also given permission to buried there. 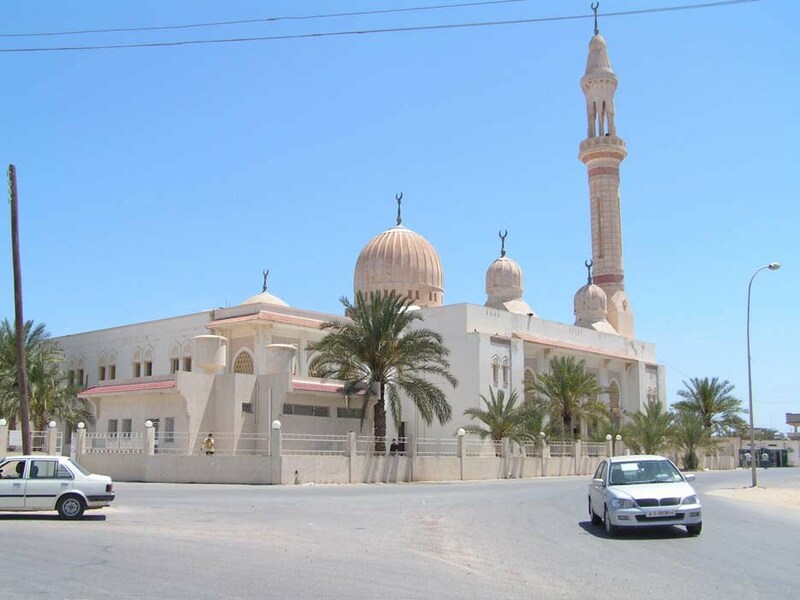 Burial in this location was also as the desire of Abd al-Rahman bin Awf and Aishah (Allah be pleased with them), all of which is a clear proof of the permissibility of burial in a building with a roof and building around a grave after burial. This is also negates the claims of those who state that burial in a building is from the special unique qualities (khasais) of the Prophet (Allah bless him and give him peace). It is also authentically reported that Sayyiduna Isa Ibn Maryam (Upon him be peace) will be buried in the room of Sayyidah Aishah (Allah be pleased with her) as detailed by Shaykh Abdullah bin al-Siddiq al-Ghumari in his two works Iqamat al-Burhan and Aqidah Ahl al-Islam. There remains adjacent to the noble graves the space for one grave. This supported by that which is narrated by Aishah (Allah be pleased with her)…her granting permission to Hasan bin Ali (upon him be peace) to be buried in the room. However Bani Umayyah prevented the burial. Al-Ismaili related this and cited the additional wording: ‘There was the space of a grave in her house’, however in the Sahih it is mentioned that Umar bin al-Khattab when he sent the message to Aisha requesting to be buried alongside the Prophet (Allah bless him and give him peace) and Abu Bakr, she replied: I had wanted it for myself, however today I give others preference to it over myself. The majority of scholars hold the view of the permissibilty of burial within buildings. Yazid bin Abdullah bin al-Shakhir instructed that he buried in his home, and he was buried there. Hasan attended his funeral and no one condemned this. For the duration that the Prophet (Allah bless him and give him peace) and then Abu Bakr (Allah be pleased with him) were buried in the room of Sayyidah Aishah (Allah be pleased with her) she would offer prayer in the room next to the noble grave. However when Sayydina Umar (Allah be pleased with him) was buried in the room she had a wall constructed between her and the graves, or would fully cover herself. Saeed bin Sulaiman informed us saying Abd al-Rahman bin Uthman bin Ibrahim informed us saying, I heard my father mention: Aishah would open her hijab up to the time when her father was buried alongside the Messenger of Allah (Allah bless him and give him peace). When Umar was buried there she covered up fully and did not untie her hijab. Ismail bin Ubaydullah narrated to me from his father from Amrah from Aishah (Allah be pleased with her) that she said: I used to remove my hijab and wear my normal clothing until Umar was buried [in the room]. I then was always carefully observed my clothing until a wall was built between me and the graves. Al-Qanabi and Abu Ghassan narrated to me from Malik that: People would enter the rooms of the wives of the Prophet (Allah bless him and give him peace) to pray therein on Fridays. This was after the passing away of the Prophet (Allah bless him and give him peace), this was when there was no space in the masjid. And tawfiq is from Allah (Most High) alone, salutations and peace be upon the Prophet, his companions, mothers of the believers and those that follow them with goodness till the last day. Resting in Peace Part 1: What Does Taking a Grave as a Masjid Mean? Many people have been shocked at the behaviour of the violent thugs in Libya and their desecration of the Maqams of pious Muslims not least a companion of the Prophet (Allah bless him and give him peace). There seems to be a fair amount of misinformation circulating amongst Muslims regarding the common phenomenon of masajid which are built adjacent to the graves of the pious, or include a grave within their complex. The worrying effect of this misinformation is the tacit approval from certain scholars, people of authority (politicians) and lay people alike for the destruction of these graves, and more alarmingly the digging out of the graves and transferring of remains. A common misunderstanding is that the hadith which prohibit taking the graves of the Prophets as a masjid mean that any grave within a masjid complex or adjacent to the main prayer hall are prohibited. Our ulema who commented on this explained that this is not the meaning of the hadith, rather what is meant is that the actual grave itself is prostrated upon or that people offer their prayer in direction of the grave as opposed to the direction of Makka. 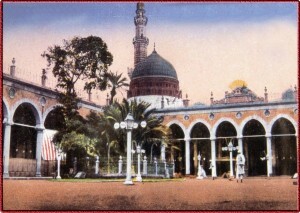 Masajid is the plural of masjid, which is the name of a physical place/location. The hadith is referring to the actual place of the grave itself and is not referring to that which surrounds the grave, is adjacent to the grave, or is above the grave. 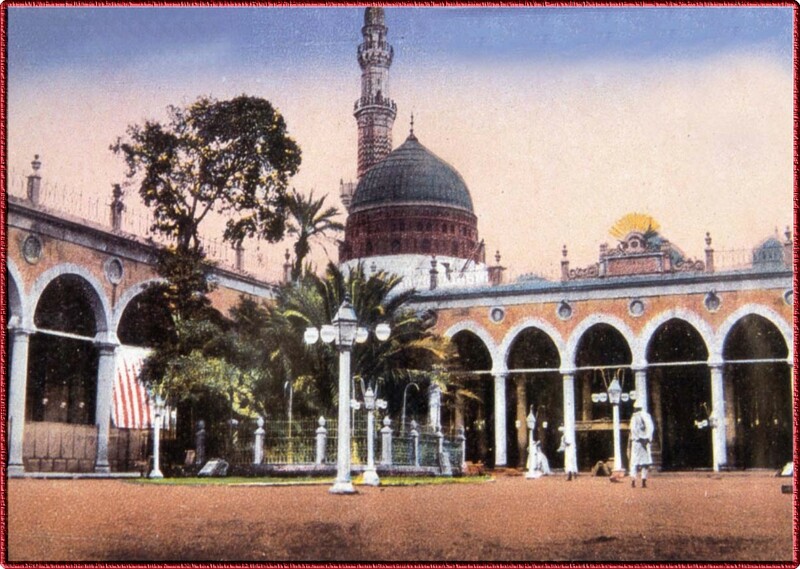 They made masajid upon them. He said: the conditional clause [upon them] indicates that making a masjid adjacent to graves is permitted [la ba’s bihi]. This hadith contains the permissibility of supplicating against the people of disbelief, the prohibition of prostrating upon the graves of the Prophets. This includes that it is prohibited to prostrate to anyone other than Allah (Azza wa Jall). The hadith can be interpreted to mean that the graves of the Prophets are not taken as a qibla (direction of prayer) to which prayers are directed…A group claimed that this hadith is evidence that it is disliked to pray in a graveyard or with a graveyard in front of one, however I do not regard this to be a proof for this. The Messenger of Allah (Allah bless him and give him peace) warned his companions and the rest of his community of the bad practices of the nations which had preceded him, who would offer prayer to the graves of the Prophets, taking them as a qibla and masjid (place of prostration). When the Jews and Christians had prostrated to the graves of their Prophets out of honouring them and making them a qibla to which they would direct their prayers, taking them as idols. As for the person who makes a masjid adjacent to [the grave of] a pious person or prays in his cemetry, intending by it istizhar of his soul, or attaining a trace from his worship, not out of honouring or facing the direction of the grave and its like, then there is no harm in this. Do you not see that the resting place of Ismail (Upon him be peace) is in the Masjid al-Haram at the Hateem? Similar points were mentioned by Qadi Iyad in Ikmal al-Muallim (2/450-452); Imam al-Nawawi in Sharh Sahih Muslim (3/17); Imam al-Qurtubi in al-Mufhim (2/128) and al-Turbushti in Mirat Sharh al-Mishkat (2/419). 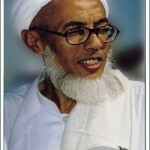 Their statement in Persian “Khudayi” means that He is necessarily existent (wajib al-wujud) due to His essence. This is because or statement “Khudayi” is a compound word made up of two Persian words. One of them is “Khud” which means: the essence of something, its person and its reality. The second is “Ayi” whose meaning is: He came. Thus our saying “Khudayi” means that He came by Himself, which is an indication to that He is existent by Himself and due to His essence, not due to another. Based on this the understanding of the term “Khudayi” is that He is existent by His essence. Taken from Qamus al-Fiqh (1/421) of Mawlana Rehmani. Q: What are his (Allah bless him and give him peace) special qualities? And from them is: Allah (most High) made his community the best of communities, and abrogated through his shariah all other shariah’s. Allah (most High) said: ‘It is He who sent His Messenger with guidance and the true religion to manifest it over all other religions, even if the polytheists hate it’ [Tawba:33]. This is a mistake from Ibn Khafif, for al-Hallaj at the time of his execution continued to affirm the oneness of Allah and cry: ‘Allah, Allah, in my blood, I am upon Islam and disassociate from everything other than Islam’. A heretic (zindiq) affirms the oneness of Allah outwardly, but his heresy is within him. The hypocrites (Munafiqun) would affirm the oneness of Allah, would fast and pray outwardly, but their hypocrisy was in their hearts. Al-Hallaj was not stupid (lit. not a donkey) that he would manifest his heresy in front Ibn Khafif and his like. Rather he would manifest it with those whom he was sure of their being closely connected to him. It is possible that he became a heretic and deviated, claimed divinity, practised magic and false supernatural feats for a period of time. Then when affliction descended upon him and he saw that death was inevitable he embraced Islam and returned to the truth, and Allah knows best his inner state. However we absolve ourselves-to Allah- from his statements, for they are pure disbelief. And we ask Allah for well being and forgiveness. Al-Hallaj was executed in the year 309. And debate with them In a Way that is better [al-Nahl:125]. And also because we have been ordered/instructed to follow, and the one being followed is not unintelligent. And because if lying was possible for them it would necessitate a lie in what He تعالى Has informed which is impossible. Giving of glad tidings and warning is not complete except by conveying, for if they did not convey the sacred laws to people they would have been concealing it. This is impossible because it necessitates concealment which is a great deficiency/shortcoming such that anyone who falls short in regards to the sacred law would have an excuse to dispute with Allah تعالى and argue claiming of lack of conveyance, and Allah تعالى has negated this in the previous verse. And because if they were treacherous by committing an unlawful or disliked act that unlawful and disliked act would become obedience with regards to them, because Allah تعالى has ordered us to follow them in their statements, actions and states. Salam, please find the latest draft translation from our beloved Shaykh Muhammad bin Alawi al-Maliki’s commentary on the ‘Aqidah al-Awam’. Say (O Messenger of Allah ): “O Allâh! Possessor of the kingdom, You give the Kingdom to whom You will, and You take the Kingdom from whom You will, and You endue with honour whom You will, and You humiliate whom You will. In Your Hand is the good. Verily, You are Able to do All things. You make the night to enter into the day, and You make the Day to enter into the night, You bring the living out of the dead, and You bring the dead out of the living. and You give wealth and sustenance to whom You will, without limit. 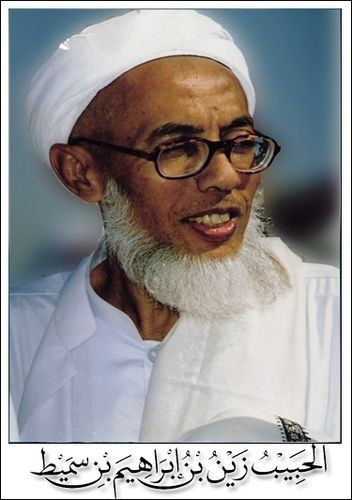 Salam, please find the next installment in this series, namely Shaykh Muhammad bin Alawi al-Maliki’s commentary on Imam al-Marzuqi’s poem ‘Aqidah al-Awam’ (as recorded by his student Ustadh Muhammad Ihya Ulum al-Din). I have made omitted some minor things from the chapter. Note: This is a draft work in need of revision. Commentary: It is compulsory upon every responsible person to know from the attributes of Allah those which are necessary with regards to Him: Which is that whose absence the intellect cannot comprehend. That which is impossible with regards to Him: Which is whose existence the intellect cannot comprehend. And the permissible: Which with regards to Him is that which is correct for the intellect to comprehend the existence and absence of. 1) Existence: Meaning the establishment (thubut) of a thing. It is certainly necessary for Him (تعالى) due to His essence and not due a cause, meaning that other than Him has not effected/caused His (تعالى) existence. As for existence which is other than from the essence (ghair dhati) such as our existence, then it is by His (تعالى) action. The evidence for this is the existence of this creation, for if it was not for Him (Glorified and Exalted is He) there would be nothing from the creation (in existence). The droppings point to the (existence) of the camel and donkey, and the footsteps to the traveller. So the heavens containing stars, and the earth with its mountain passes, and oceans and with its waves, do they not point towards a wise, powerful, all knowing creator? 6) Oneness: It is the absence of a multiplicity in His (تعالى) essence (dhat), Attributes (sifat) and Actions (afal). The meaning of oneness of the essence is: That His essence is not constructed from parts, and that He has no partner in His dominion. The meaning of oneness in attributes is: That no one has an attribute which resembles any of His attributes. 7) Power: It is a beginning less attribute established in His (تعالى) essence by which He brings into existence and non existence. 1) Attributes of Self (Sifah al-Nafsiyyah): Linked/related to the self, meaning the essence. The attribute of the self is that which the essence cannot be rationally conceived of being without, and it is one: Existence. 2) Attributes of Negating (Sifat al-Salbiyyah): Linked/related to [the term] negating, meaning nullifying. They are named negating because they negate from Allah (Exalted) that which does not befit His Majesty. And they are five: Without beginning, Everlasting, Non resemblance to all events, Self Subsisting, and Oneness. 3) Attributes of Meaning (Sifat al-Maani): They are named as ‘Meaning’ because they affirm for Allah (Exalted) meanings existing and established in His essence befitting His perfection, and they are seven: Power, Will, Knowledge, Life, Hearing, Seeing, Speech. 4) Attributes Pertaining to Meaning (Sifat al-Manawiyyah): Linked/related to the seven (attributes) of meaning of which they are a branch. They are named as ‘pertaining to meaning’ because they are necessarily follow from the meanings. They are that He is: Powerful, Willing, Knowledgeable, Living, All Hearing, All Seeing, Speaking. i) Mentioning the beliefs in a detailed manner, because the danger of ignorance in it is great. I have not been posting as regularly as I would have liked, but I have been working (slowly) on the commentary of the ‘Aqidah al-Awam’ and other projects some of which Insha-Allah I will post on here (may Allah the Exalted give us tawfiq to complete them). The Second: To worship Him or perform an act of obedience seeking reward and fearing punishment, or desiring paradise or fearing the hellfire. And this is the middle. The Third: To worship Him in order to be ennobled by worshipping Him, and to be associated with Him (Most High) so that it is said: This is a worshipper and righteous person. Or to to a thing to attain the dunya such as if you read Surah al-Waqiah for wealth and its like. And this is the lowest of them. For if you did it to show off or for fame this is unlawful for you due to the absence of sincerity (ikhlas). Fudayl bin Iyad said: Leaving an action due to people is showing off (riya), and action due to people is polytheism (shirk), and sincerity is that Allah (Most High) protects/saves you from them both. Salam. Please find below the Introduction along with its commentary. I have omitted the inclusion of the discussion surrounding individual words which can be found in the commentary for a number of reasons. Inshallah perhaps they can be incorporated in the future. Commentary: I begin the writing of this poem ‘Aqidah al-Awam’ with the basmalah seeking help from Allah (عز و جل) whose mercy has encompassed everything, and whose bestowing and blessings are continuous without break nor decrease. First: Following the noble book in its order not in its sequence of revelation. Third: Following the Prophet (Allah bless him and give him peace) who would begin his writings and letters with the basmalah as has come in his (Allah bless him and give him peace) letter to Harqal and others. Commentary: I also begin adding to the writing of this poem with praise for Him, meaning by Praise for Allah with the tongue, the Without Beginning, the First, the Last, the Everlasting. Along with honouring Him and believing that all praise is established for Him. Second: Fulfilling the right of a thing which is incumbent upon him which is expressing thanks for blessings from amongst which is the authoring of this poem. I like it that a person should precede his speech (khutbah) and every matter he seeks with the praise of Allah (the Exalted) glorifying Him (Glorified and Exalted is He) and sending blessings upon the Messenger of Allah (Allah bless him and give him peace).